Catsparella: James Bowen and Street Cat Bob Charm Viewers On "BBC Breakfast"
James Bowen and Street Cat Bob Charm Viewers On "BBC Breakfast"
Update: The original March 2012 interview referenced in this post has been removed from YouTube, but you can watch James and Bob's Feb 2013 appearance on Breakfast TV here. 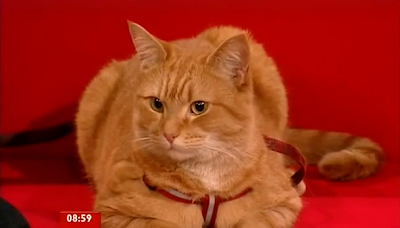 Just when I thought we couldn't love Street Cat Bob any more than we already do, Bob and his owner James Bowen took to the airwaves earlier this week for a charming on-air chat with "BBC Breakfast." The street performer and his kitty were making the rounds to promote their book,"A Street Cat Named Bob: How One Man and His Cat Found Hope on the Streets," which was released earlier this month. Bowen, who once struggled with drug addiction and still lives in support housing, told hosts Susanna Reid and Bill Turnbull: "(Bob has) taken care of me, given me unconditional love, and changed my perspective on life." He hopes that the popularity of the book will result in more opportunities for himself and the well trained cat, who he says never expects anything more than "love and a couple of biscuits." James and Bob were joined on the set by literary agent Mary Pachnos, who explained how it took her a week to work up the nerve to talk to them outside the Angel tube station. Pachnos says that in the short time it has been out, Bob's book has already been released in eight different languages, and there are even hopes that Hollywood will come calling. Turnbull joked that Bowen would be played by "Marley & Me" star Owen Wilson in a film adaptation of the feline tale, but personally I'd prefer to see Joseph Gordon-Levitt in the lead role of the cat-loving busker with a heart of gold! "A Street Cat Named Bob" is on sale now through Amazon UK, and also available for pre-order in the US. Thanks to John (@enigmachine) for the tip! AWWWWWW. What a cute cat! He's so composed! I love it. He's such a great representative of cat-dom. It seems like when you usually see cats on live tv shows, they are nervous and scared, but this guy is a natural!